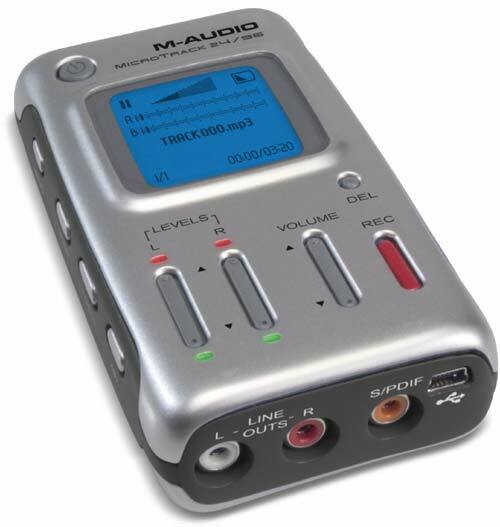 The M-Audio MicroTrack portable recorder (prototypes were called FlashTracker) is now official. See the awkward press release (via Harmony Central; as usual M-Audio’s Website is lagging). Who’s writing this stuff? “Leaps in miniaturization technology”? (Sorry, a leap in tech would involve a $99 price.) “One of the secrets to the . . . compact size” is the use of CompactFlash? Well, okay, I suppose that might be a secret to someone who’s been living in a cave since 1990. (Hey, where’d my DAT go? And what’s this World Wide Web?) And “it will also be embraced by other markets including business, education and worship.” Well, first, we’ll wait to see if it gets embraced. Second, the mention of “worship” gives me images of people in robes circling around a MicroTrack on a pedestal, chanting. Oh, wait — you mean use by the worship market. Right. Press release gripes aside, this confirms reports we’ve been getting since the spring. Basically, you’ve got the form factor of an iPod or WMA portable player, but with all the pro recording specs those devices miss: 24-bit/96 kHz uncompressed audio, phantom power for mics, and digital input, li-ion rechargeable battery, all in a cute little unit that connects via USB. CompactFlash is certainly the way to go: a quick Froogle search reveals a name-brand 1GB card is just about US$70. Excellent. But you might want to just stick that in an R-1, and spend the rest of the money on a 5-star dinner. More once I’ve seen this puppy up close. Oh, and as usual, Music Thing thinks it doesn’t look cool enough. CDM 5 words: Now make it 300 dollars.